These reports point to a growing death toll off Europe’s shores which this year already approaches 3,000. 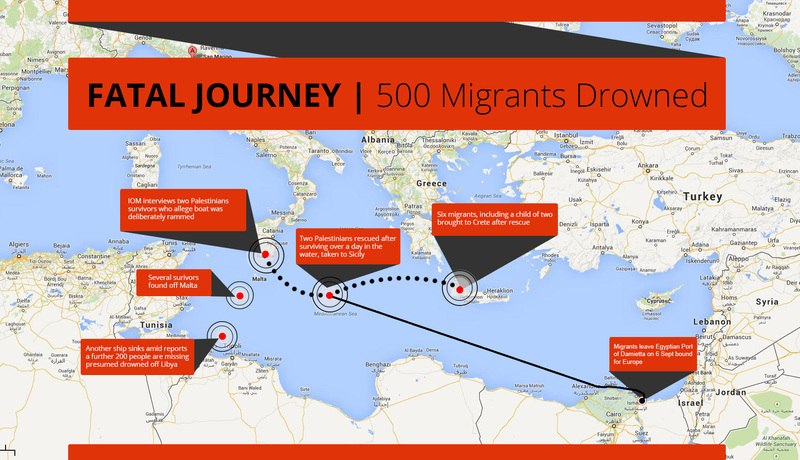 That’s nearly four times the figure from 2013, which IOM’s Missing Migrants Project estimated to be 700 deaths. “If survivors’ reports are confirmed, this will be the worst shipwreck of migrants in years, not an accidental tragedy, but the apparent deliberate drowning of migrants by criminal gangs who extort money for their desperate journeys. Their actions are as callous as they are evil,” said IOM spokesperson Leonard Doyle. Geneva - IOM Greece staff in Crete today interviewed more survivors of the deliberate shipwreck of migrants heading to Europe from Egypt. The survivors provided corroboration that the traffickers turned violent when the 500 migrants they were escorting to Europe refused to switch to an unseaworthy boat. The survivors told IOM Tuesday that they already had been forced to change boats three times. When they refused a fourth switch - because they felt the smaller vessel was unsafe – an violent argument ensued. The smugglers threatened that if the passengers did not board the smaller boat they would be returned to Egypt, the survivors told IOM. The migrants persisted saying they would rather return than board the smaller boat. At this stage, according to testimony from four of six survivors, the ten smugglers, said to be Palestinian and Egyptian, began yelling and throwing sticks at the migrants. The smuggler’s vessel approached the boat with migrants some of whom managed to jump into the smaller boat. Witnesses say the smugglers forced them in the water and then rammed the bigger boat. It began to sink immediately while the smugglers stayed in the area until they were certain that the migrant’s vessel had sunk, witnesses said. “After they hit our boat they waited to make sure that it had sunk completely before leaving. They were laughing” one of the survivors told IOM. “When the boat was first struck, one of the passengers killed himself in despair by hanging,” he added. The survivors, women among them, included two Palestinian nationals, an Egyptian national and one Syrian. All the witnesses stated that the smugglers were Palestinian and Egyptian nationals. The two Palestinian survivors in Crete said their voyage began hopefully at what they called a “travel” office in Gaza, which made arrangements to get them to Italy. The cost of travel for each migrant was US$2000, paid in advance. The survivors said they had received grants to rebuild their homes and used that to pay the smugglers. The migrants were advised by the “travel” office to be in a particular spot in Egypt so that they could travel onwards by boat. According to their statements, they arrived separately at the rendezvous in Egypt where four buses waited to take them to the Port of Damietta near Alexandria. The survivors estimated that each bus contained up to 100 persons. At the port they boarded a ship, which they estimated was 15-18 metres long with migrants already aboard. “When we got to the port to board it looked like the ship was already half full,” the witness said. The Captain did a headcount, and without including minors under 10 years old, counted 400-450 migrants. Based on this testimony IOM believes that up to 100 children may have been aboard and are lost at sea. According to witnesses testimony the ship had two decks with 300 people below and 200 on the upper deck. They were at sea for four days and had to change to smaller vessels three times. Witnesses stated that the 300 people who were in the lower deck were trapped and drowned immediately. The survivors say they watched as those thrown in the water clung to each other trying to stay alive. “The rest of us linked arms in a circle so that no one else would be lost,” a survivor told IOM in Crete. Several managed to stay above the water for up to three days. But on the third day the weather changed: strong winds and waves swept the area and people began to disappear under the water. Sometime later a freighter picked up nine survivors. Seven of these, including a 2 year-old girl were flown by a Greek military helicopter to hospital in Crete. One of the survivors perished and a girl remains in critical condition. Survivors in Crete have provided the authorities’ information on the criminal gangs to the Greek Coastguard.